Does your Chevrolet hood no longer stay up or open? This problem is caused by weak hood struts that no longer provide the lifting force to keep the hood up. In this guide, you will find instructions on how to change the hood lift support on Chevrolet vehicles equipped with gas hood struts. Changing the hood lift support on Chevy vehicles is easy and takes less than half 30 minutes. The hood strut may be the culprit if you are experiencing any of the following problems. Open the hood of your Chevrolet. 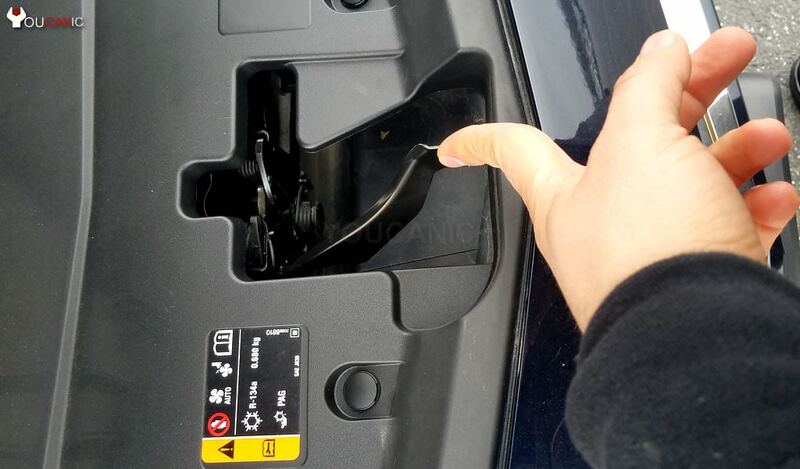 The hood latch release is located under the dashboard on driver's side. Have a friend hold up the hood of your Chevrolet. If the hood falls while you are changing the hood lifts on your Chevrolet, you can get seriously injured. Secure the hood in upright position. Locate the hood struts that need to be replaced. Locate the clip that locks the hood support locks to the lower ball joint. Chevrolet Malibu hood strut connection to the body, near suspension strut tower. Use a flat screwdriver to pry out the clip that locks the hood strut in place. Once the clip is pulled out, you can remove the hood strut from the lower ball joint. Follow the same procedure for the end that connects to the hood. Install the new hood support in reverse order. Repeat this procedure for the second hood strut if your Chevrolet is equipped with two. Note that this guide does not apply to models that use a prop rod. This guide applies to Chevy vehicles with gas hood struts found on models such as Chevy Spark, Sonic, Bolt, Volt, Cruze, Malibu, Impala, Camaro, Corvette, City Express, Trax, Equinox, Traverse, Tahoe, Suburban, Colorado, Silverado, Sonic, Blazer, Astro, HHR, Uplander, Avalanche etc.